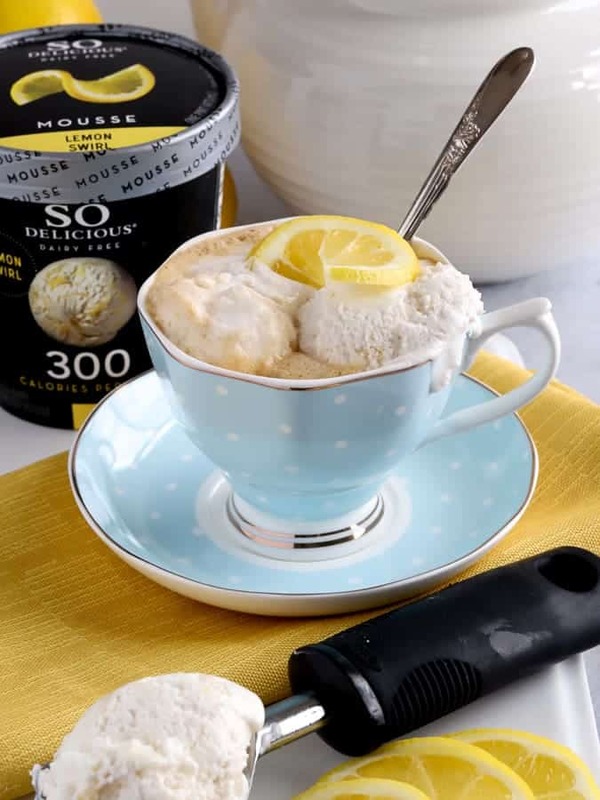 Tea Affogato is a simple and elegant dessert that pairs Lemon Swirl So Delicious® Dairy Free Non-Dairy Mousse with hot tea. 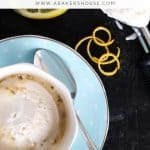 A play on the classic Italian affogato of ice cream and espresso, this easy no bake dessert is vegan, gluten free, and dairy free and ready in less than ten minutes! 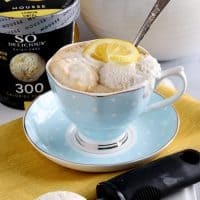 If you’re looking for a simple, elegant dessert that is perfect for entertaining, give this tea affogato a try! With spring celebrations in full swing, there are many occasions for family gatherings. Easter dinner, Mother’s Day, wedding showers, baby showers, graduations and other spring festivities call for special desserts. Making dessert for a large group doesn’t have to be difficult. Simplicity is best when serving a crowd and this playful tea affogato is perfection. A short ingredient list and easy preparation makes affogato an easy choice for dessert! So Delicious® tempts your taste buds in the frozen section of your grocery store. On my recent shopping trip to Sprouts Farmers Market, I was impressed by the array of flavors and products from So Delicious®. All products are dairy free and these frozen desserts will delight dairy lovers too. Check out Cashewmilk frozen desserts in new flavors like Peachy Maple Pecan and Chocolate Drizzled Bananas Foster. Oatmilk frozen desserts are new to the line up and come in flavors like Oatmeal Cookie and Caramel Apple Crumble. Wow! What creative combinations! The fun continues with Almondmilk frozen desserts in Mocha Almond Fudge and a Gluten Free Cookies ‘N Cream. And coconutmilk frozen desserts like Coconut Macaroon and Mint Chip give you so many choices that you could sample one flavor each week all spring and summer long and still not run out of new options. The non-dairy Frozen Mousse caught my attention too. All of the flavors are 330 calories or less for the WHOLE pint (3 servings per pint). The flavors read like a gourmet menu: Salted Caramel Swirl, Cranberry Cherry Swirl, and Peanut Butter Swirl. The frozen mousse is creamy and light with a soft texture. First let’s state the obvious: you could serve any flavor of So Delicious® non-dairy frozen mousse to your guests and they would be happy. Simple as that. No need for fancy toppings or sauces– the non-dairy mousse on its own is a creamy and fluffy sweet bite to finish a meal. 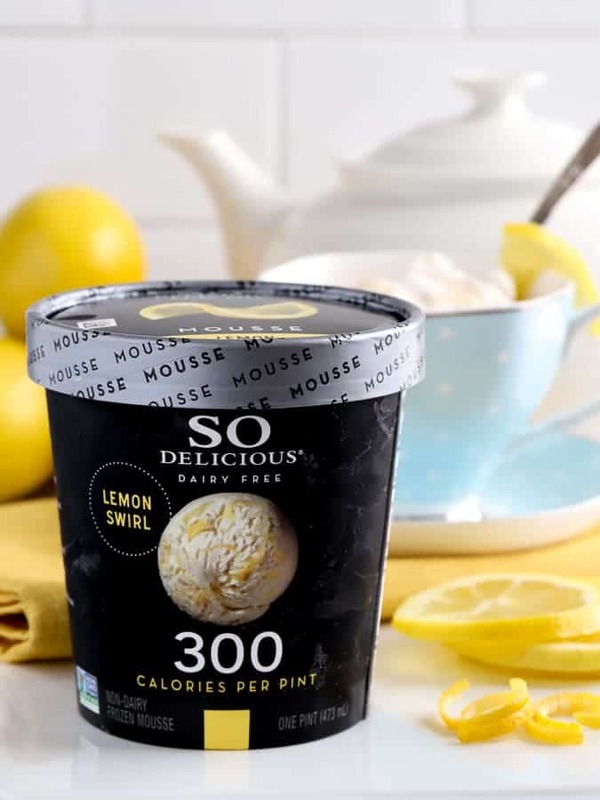 Gosh, hand me a spoon and a pint and I could easily go through all three servings of the Lemon Swirl on my own (all that for only 300 calories!). 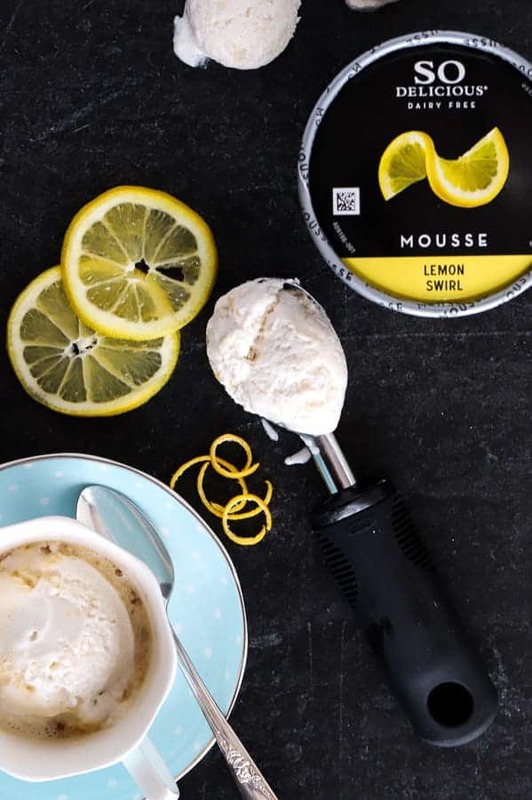 We can take this frozen dessert up a level by using Lemon Swirl non-dairy frozen mousse in an affogato recipe. An affogato is an Italian dessert which traditionally calls for ice cream and a shot of espresso or strong coffee. Affogato translates to “drowned” in Italian and the espresso covers the ice cream creating a creamy combination of hot espresso and cold ice cream. So the meaning of affogato is literal—you drown the cold with the hot and create a dessert that delights the senses. We’re changing it up today and playing with the concept of affogato but with tea. At first the pairing of hot tea and cold mousse might seem out of the box, but English tea drinkers have long enjoyed adding milk or non-dairy alternatives to their many cups of tea. Another way to think of an affogato is to compare it to a root beer float. The layering of a cold, frozen dessert with a beverage (like root beer, coffee or tea in this case) is straight forward and oh so easy. 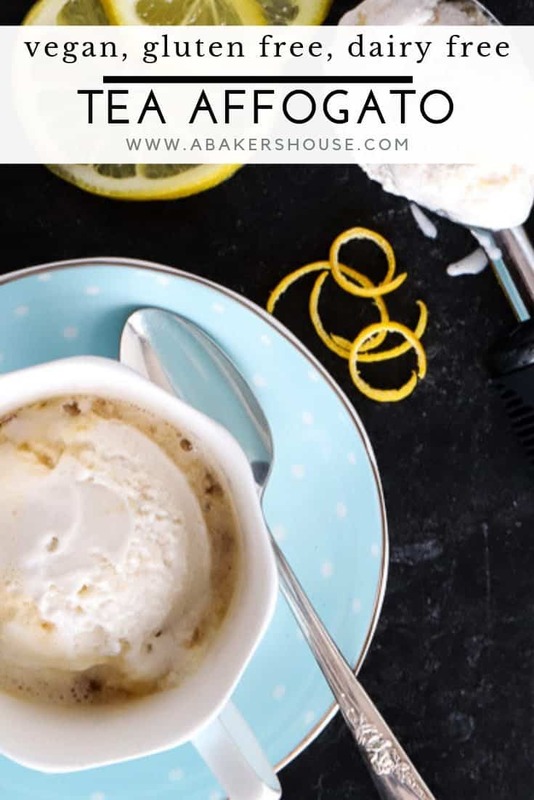 This Lemon Swirl is fluffy and airy and fits perfectly into this affogato recipe. When the hot and cold mix, a frothy layer develops and you are treated to a spoonful of cold Lemon Swirl with the heat of tea lingering underneath. It really is playful and a twist that is surprisingly tasty. I like to serve tea affogato in a pretty tea cup rather than a bowl but either will do. The tea cup presentation emphasizes that tea is part of the recipe and the non-dairy frozen mousse in a tea cup is such a surprise! You’ll want to keep your ratio of mousse to tea at least 2 to 1 as I’ve suggested in the recipe. If you flip it and add too much tea to not enough mousse then you’ll just have tea soup—which might be tasty but won’t be the affogato dessert you are looking for. No problem if you pour too much tea over your mousse—simply add another scoop of mousse on top. How do you make tea affogato? 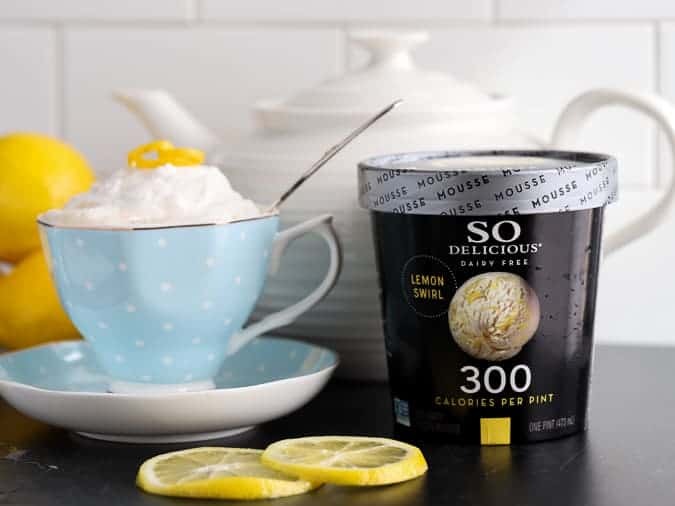 Place two scoops of So Delicious® non-dairy frozen mousse in a tea cup, mug, or bowl. Boil 1 cup of water and steep the tea for 4-6 minutes. Pour the tea over the frozen mousse. With so many frozen dessert offerings, you can make a variety of affogatos that are dairy free, gluten free, and vegan. Try coffee or tea! Buy So Delicious® products at Sprouts Farmers Market! Sprouts Farmers Market has a fantastic deal going on for select So Delicious® yogurt alternatives and frozen dessert products. Use the Sprouts App and take on the Checkout Challenge where you buy 4 and get 1 free beginning in April and running through June. Take advantage of this special offer and try a number of mouth-watering flavors. Salted Caramel Swirl and Chocolate Chip are two pints of the non-dairy frozen mousse that I can’t wait to share with my family! 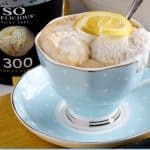 Tea affogato with So Delicious® Non-Dairy Frozen Mousse is a delightful vegan, gluten free and dairy free dessert! 1. 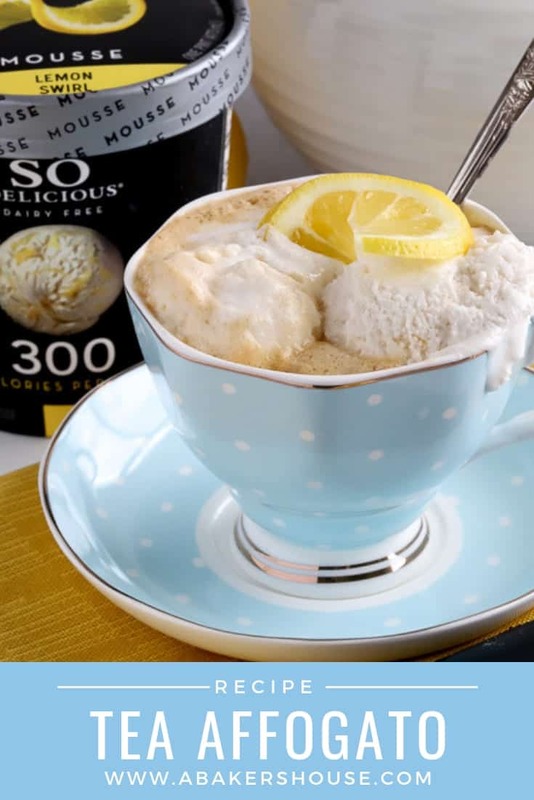 Scoop 2 scoops of Lemon Swirl non-dairy frozen mousse (each approximately 1/3 cup) into a mugs, tea cups, or bowls. 2. Boil 1 cup of water and pour it over the tea bag. Let it steep for 4 -6 minutes. 3. Pour 1/3 cup of tea into each serving of non-dairy frozen mousse. Serve immediately. If you like this dessert, you’ll love making more vegan and gluten free desserts at home. I vote for coffee with mocha almond fudge but then again this lemon sounds out of this world, too. How is a girl to choose? I will have to try these non dairy products. I haven’t had them but I do love Sprouts! 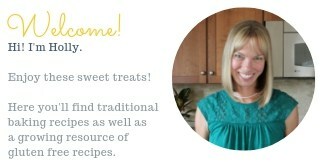 Thanks, Abbe! You are right- so many flavors to choose from! You can’t go wrong.